In 2010 the German holding company AURELIUS AG acquired Danfoss Household Compressors from the Danfoss Group, Denmark. We are a Danfoss Compressor trade supplier based in Devon. 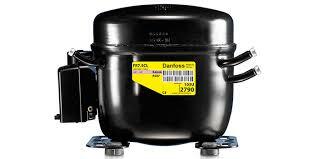 We have a wide range of Danfoss SECOP Compressors in stock and available to buy online, direct from us. Danfoss Compressors are designed for medium/high temperature applications and they are of the hermetic reciprocating type. At Climate Controls you can buy your Danfoss Compressor products online or over the phone on 01752 894 777. Many of our Danfoss Compressor products come with next day delivery, and can also be collected in store using our click and collect service. We’re a South West based supplier of Danfoss Compressors and we can guarantee our products are of the highest quality. Also, with our extensive range of Danfoss Compressors, we’re sure to be able cater to all your compressor and condensing unit needs.